Last week, American Enterprise Institute analyst Dan Blumenthal published a report on Asian Alliances in the 21st Century in conjunction with a team from the Washington-based Project 2049 Institute. The report argues that there’s little alternative to US primacy in Asia, despite impending defence cutbacks that threaten to attenuate US diplomatic influence in the region. No single power or coalition appears capable of, or interested in, assuming custodianship of the ‘commons,’ the international waters and skies on which the globalised system of trade and commerce depends. Rising China ‘is neither a candidate for the kind of benign hegemonic rule that others would find legitimate, not much interested in aiding Washington in shouldering global responsibilities’. Quite the opposite. Beijing is amassing ‘anti-access’ capabilities precisely to grant itself the option of keeping US reinforcements out of the Western Pacific. 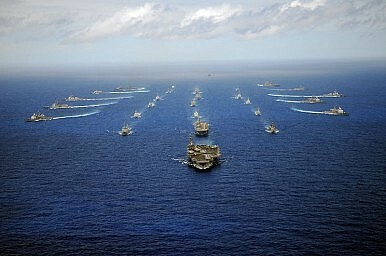 Preserving the status quo in maritime Asia, opine Blumenthal and his co-authors, demands that Washington reinforce its ‘command of the commons,’ bolstering the credibility of its security guaranteesvis-à-visallies such as Japan and South Korea. If US promises lose force, the remorseless logic of ‘self-help’ will take hold, prompting Asian countries to look to their own defences. The report contends that this is already happening to a degree. For instance, the Japan Maritime Self-Defence Force and the South Korean Navy are adding guided-missile destroyers equipped with the US-built Aegis combat system to their fleets. Such material acquisitions broaden the foundation for allied collaboration. Used effectively, such hardware would help US forces fight their way into the theatre, puncturing Chinese anti-access measures. So the United States remains the security provider of first resort, but it increasingly needs allied help to bring its armed might to bear. Like Robert Kaplan before them, the authors observe that the United States’ post-World War II alliance system has a ‘hub-and-spoke’ quality to it. For a variety of reasons—notably the Asian allies’ desire for flexibility within alliance arrangements, and longstanding historical animosities among them—Washington has contented itself with a series of bilateral relationships, each a ‘spoke’ radiating outward from the ‘hub’ at the US Pacific Command in Hawaii. For the authors, however, China’s military rise renders this improvised system largely moot. To cope with new geostrategic realities, they insist that an alliance ‘network’—a true transpacific alliance—must replace the makeshift arrangements that sufficed until now. Theirs is an audacious vision. To make good on it, Asian states must bolster their military capacity to contest Chinese aggression while holding out long enough for US forces from Guam, Hawaii, or the US west coast to break into the theatre. Bulking up their armed forces is hard enough. But the impediments to constructing a unified alliance are as much cultural as material. Tokyo probably needs to lift its self-imposed cap on defence spending to field competitive forces. This requires Japanese to rethink their pacifist traditions. Washington will need to adjust to more equal relations with its allies, since they will contribute more to the venture and will expect greater say-so in alliance circles. And prospective Asian allies must overcome lingering enmities to present a united front. Getting past Japan’s imperial past on the Korean Peninsula and the South China Sea, for example, is essential to erecting a cohesive alliance. The authors cite NATO’s acceptance of West German rearmament and alliance membership as a hopeful precedent for such Copernican shifts of worldviews. Whether would-be allies see themselves facing a threat as overpowering as the Soviet Union—a threat that trumps lesser concerns—will likely decide whether the NATO analogy fits. Still, I have little quarrel with any of this. It’s sound strategic analysis. It’s worth pointing out, however, that the United States is not the only great power practicing hub-and-spoke diplomacy in Asia. China is doing so as well, and its approach is truer to historical precedent. Beijing desperately wants to keep Asian powers from joining forces. Hence its vehemence about negotiating with Southeast Asian capitals individually rather than through a wider forum such as ASEAN. The authors may actually understate the complex geometry of alliance relations in Asia. Same spokes, different—and competing—hubs. The face of the older brand of hub-and-spoke diplomacy is Otto von Bismarck, the founding chancellor of united Germany and one of history’s best-known practitioners of power politics. Bismarck was acutely conscious that Germany’s central position in Europe and its preponderant industrial and military strength could alarm neighbouring great powers, exposing the Reich to encircling alliances. Like contemporary China’s leadership, the ‘Iron Chancellor’ went to extraordinary lengths to prevent potential foes from uniting against the central power in a volatile region. That meant forging closer ties with European capitals than they could maintain among themselves. As Henry Kissinger tells it, Bismarck sought to deny fellow European powers ‘any cause to join an alliance directed against Germany.’ Keeping them from seeing Germany as a threat was uppermost in his diplomacy. Accordingly, he portrayed the Reich as a ‘satiated’ power that entertained ‘no further territorial ambitions’ at its neighbours’ expense. The chancellor also employed such expedients as encouraging French colonialism, believing this would distract Paris from European geopolitical competition while generating frictions between France and the world’s premier imperial power, Great Britain. And he performed the unlikely feat of forging alliances with both Austria and Russia, two empires perpetually at loggerheads in south-eastern Europe. Such measures pacified the Reich’s eastern and western frontiers. In short, Bismarck’s Berlin deliberately kept the spokes separate to forestall a hostile alliance, whereas the Project 2049 team would have Washington merge the spokes into a unified defence pact. These are two very different approaches to hub-and-spoke diplomacy—and Chinese diplomacy is cast in the Bismarckian mould. Here endeth the history lesson. Constructing a US-led alliance will be an interactive process in which Beijing casts a ‘vote’—and doubtless covets a veto. US alliance managers must not discount Chinese efforts to apply a solvent to allied unity. But the good news is that Beijing’s hub-and-spoke diplomacy has proved far clumsier in recent years than anything masterminded by the Iron Chancellor. It owes more to bluster and intimidation than to Bismarckian subtlety, guile, or appeals to raw self-interest. Asian Alliances in the 21st Century nonetheless requires Washington to strike a delicate balance. It must sustain the allies’ confidence in US steadfastness and military capability while simultaneously sowing doubts about the United States’ long-term staying power in the Western Pacific. If US officials reassure their Asian counterparts too persuasively, the allies will see little need to modify the current system. Why fix what ain’t broke? If Washington paints too bleak a picture, on the other hand, it might dishearten Seoul, Tokyo, and other partners. It might unwittingly convince Asians that they must assume the primary burden for balancing Chinese power, perhaps even through going nuclear. Or they might resign themselves to ‘bandwagoning’ with Beijing—deferring to China for the sake of self-protection. Neither outcome would represent an improvement on the status quo underwritten by the United States. But it may take American statesmanship worthy of a Bismarck to pull this one off.